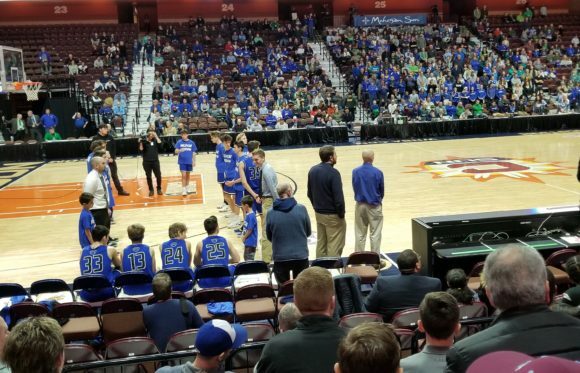 A huge crowd of Old Lyme supporters came to the Mohegan Sun arena to cheer on their team. Photos by Lynn Fairfield-Sonn, Carol Frazier and Jack Collins. Prior to tip-off, Old Lyme engaged in their traditional motivational huddle. 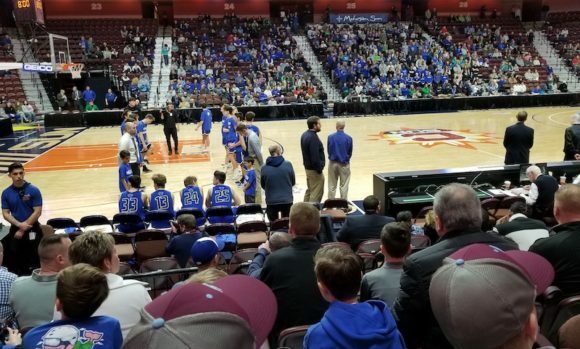 For a small couple of towns like Lyme and Old Lyme, this was an amazing show of support and belief in this team and its coach, who just two short years ago found themselves on the wrong end of a 6-18 season. The Old Lyme team stands proud while the national anthem plays before the game began. Sadly, neither the team nor the fans saw their dreams come to fruition. The teams were announced in the traditional manner. Third-seeded Old Lyme were first out of the starting blocks storming to a 10-2 lead in a little over four minutes. 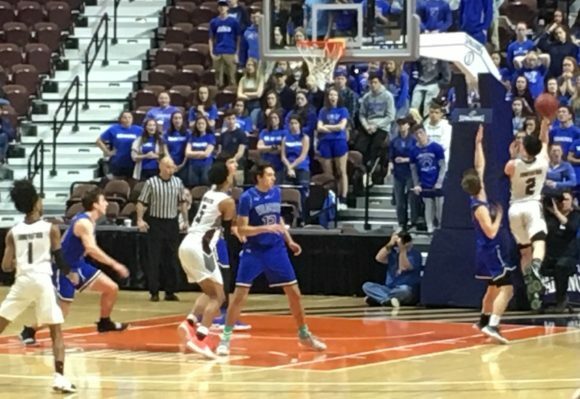 Everything seemed to be going their way when top seeds Innovation woke up and by the end of the first quarter had overtaken the Wildcats by 12-10. Junior guard Ray Doll with arms outstretched was in the thick of the on-court action. Old Lyme never took the lead again falling to 23-30 by the half. Scoring became a real challenge for the ‘Cats who ended up achieving only a 25% success rate. 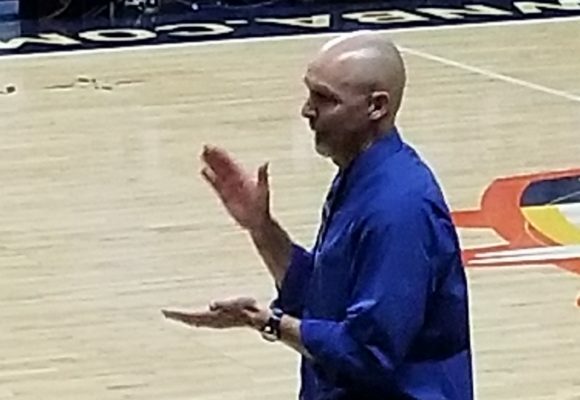 Coach Kirk Kaczor urges on his team. But Coach Kaczor never gave up on his boys encouraging them all through the contest. 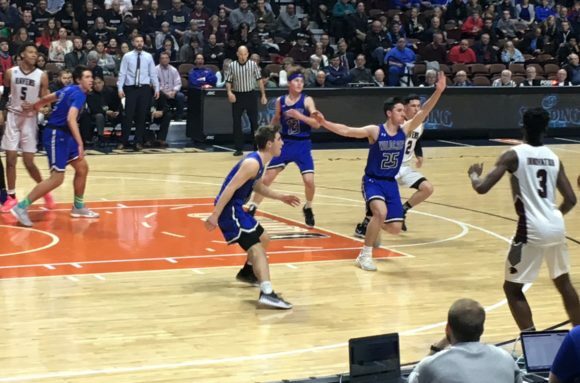 By the end of the game, Ray Doll and Brady Sheffield, who are both juniors, had scored 11 points each and Aedan Using, another junior, had contributed eight, but more significantly had also joined the elite group of Old Lyme players, who have scored 1,000 lifetime points. Doll and Using also respectively had eight and five rebounds while senior Liam Holloway notched a game-high five steals. Action at the free throw line. 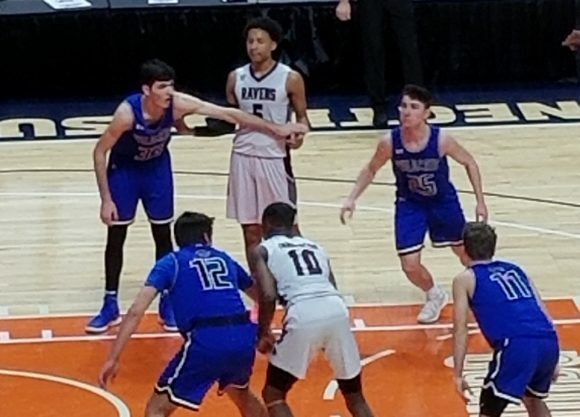 Innovation continued their formidable advance through the third and fourth quarters taking their lead to 20 clear points at 58-38 with 2:58 remaining on the clock. 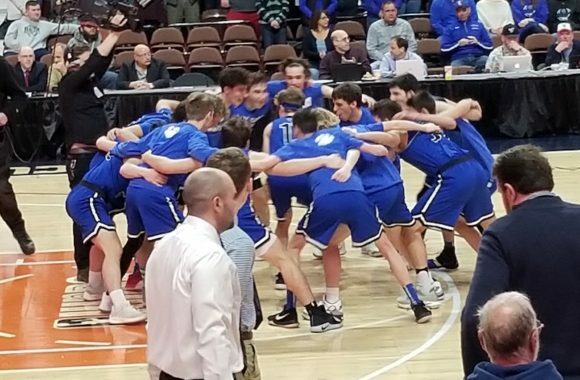 Old Lyme began to see the writing on the wall and heard the final buzzer with their heads held high but their hearts down low. Leaping high to shoot, an Innovation player looks to score. 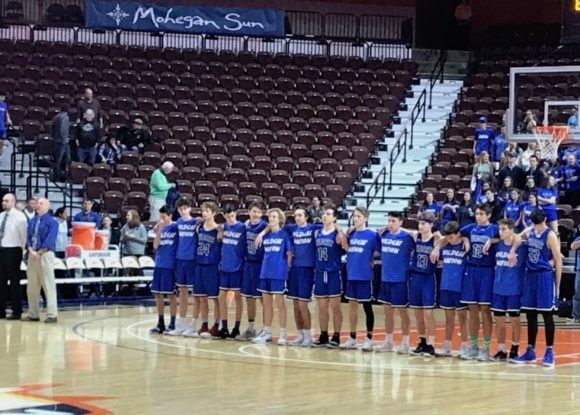 Thank you, Old Lyme boys and Coach Kaczor for such a great season. You have made our towns proud. You may not have won the state championship but you’ve rewritten the history books for the program by simply reaching the state final. We will always remember this outstanding team and their run to the Sun! Congratulations … and see you next season! Editor’s Notes: Special thanks to our photographers at the game, Lynn Fairfield-Sonn, Carol Frazier and Jack Collins.